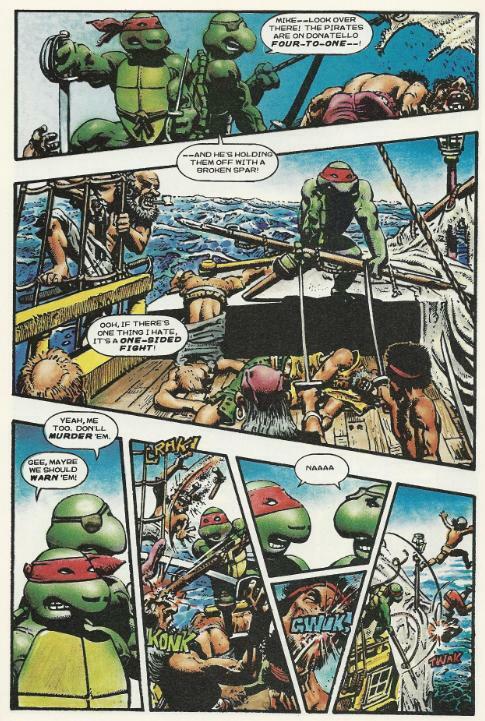 On a pirate ship in 1500 AD, the Turtles are mixing it up with a band of cutthroats. After some comical battling, they defeat the pirates and find the treasure they stole from “the widows and orphans” fund. A nobleman thanks the Turtles on behalf of the King and asks if they’d like to join his crew. They decline, as they need to be getting back to their proper time period. Donatello pulls out the Time Cube they used to travel to the past, but it appears to have been slightly damaged in the fight. Raphael recalls how they were just lounging around the living room when the Time Cube suddenly appeared in front of them. Attached to it was a note from Renet, saying that she “borrowed” it from Lord Simultaneous. She tells them to have fun and that the Time Cube will "anamorphically autosynchronize" them to whatever time period they travel to (adapt their appearance to fit their surroundings). Her one warning is that they must return slightly after the time they left, as encountering themselves could result in a universe-shattering paradox. With the flashback over, Don activates the Time Cube, but because it’s damaged it doesn’t take them back to the precise time he wanted. Instead, they wind up in their living room a few seconds BEFORE they left, not after. Their past selves confront them, thinking they're imposters, and draw their weapons. Suddenly, the paradox they’ve created causes a “time quake” as “natural time” tries to right things and work off the excess chronal energy. As a result, the Turtles are thrown back in time and become baby turtle eggs in the sewer. They manage to get their legs free from their egg shells just as an alligator begins to approach. They run and tumble into the water as the gator moves in to swallow them. Another time quake, however, thrusts them even further back in time. Leo, Raph and Mike find themselves in the Middle Ages, garbed in armor. They ponder where Don has gone, but haven’t time to consider it as several knights mistake them for demons and attack. 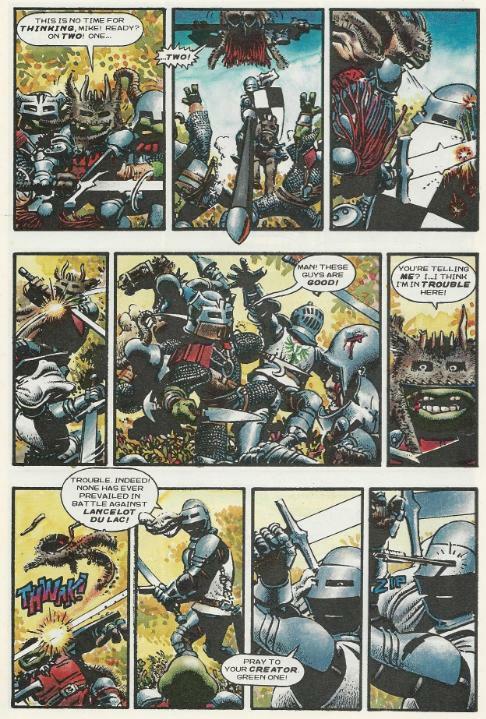 The Turtles take on the knights, but are badly outnumbered. Luckily, Don shows up in archery garb and kills a knight identifying himself as “Lancelot”. The Turtles slaughter the knights and win the battle, but one look in their satchel reveals the Holy Grail, meaning these were the Knights of the Round Table they just killed. Before the Turtles can realize how badly they’ve screwed up history, another time quake takes them all back to the Dawn of Man. As the Turtles mess with their loin cloths, Don reminds them that any interference with their surroundings could catastrophically alter the growth of mankind. They’re immediately attacked by apes who want to eat them. Don loses his cool and kills all the apes. Looking over his handiwork, he realizes that he’s just wiped out all humanity. Another time quake grabs them and whisks the Turtles away. The Turtles find themselves plummeting through empty space toward a bright light. Their very existences being stretched, Don realizes that they are at the beginning of time and are about to become one with all creation. The Turtles then wake up in their living room. Time appears to have corrected itself and undone their various paradoxes. Even the Time Cube has been repaired as though they’d never used it. Don begins fiddling with the Time Cube, curious to see what two thousand years in the future is like. Leo, Raph and Mike, however, have had more than enough time travel for one day and pounce on him. *As part of the “guest era”, this issue is not considered canon to the Mirage TMNT continuity “proper”. However, there really isn’t anything contradictory about it regarding the Mirage TMNT series, so it’s up to the reader as to whether it “counts” or not. *The Turtles first met Renet back in TMNT (Vol. 1) #8 and last encountered her in Tales of the TMNT (Vol. 1) #7. 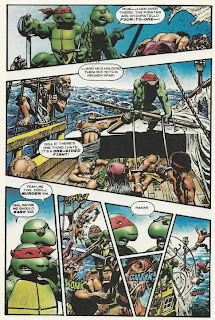 *Richard Corben previously collaborated for a TMNT short story, “You Had To Be There”. *This issue was originally published in full color. It was reprinted in full color by Heavy Metal in TMNT 25th: A Quarter Century Celebration. *If the publication dates on the cover are to be believed, this issue came out *before* TMNT (Vol. 1) #31. 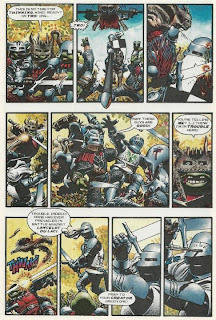 I have no experience with Richard Corben beyond what he’s done with the TMNT. There are a lot of great comic artists and authors out there whose work I’ve yet to read in depth and Corben, I’m afraid, is one of them. I only have so much time and so much money. I can’t read everything. So when I read the two page introduction for this issue by Kevin Eastman, going on and on about the unparalleled glory that is: The Richard Corben …I couldn’t help but feel a disconnect. Not that I doubt that Corben’s one of the greats, but that I’ve never read any of his great stuff and I really wouldn’t categorize his TMNT work as “great stuff”, personally. Beautifully inked and colored stuff, definitely. But great? I’m a tad incredulous about that. 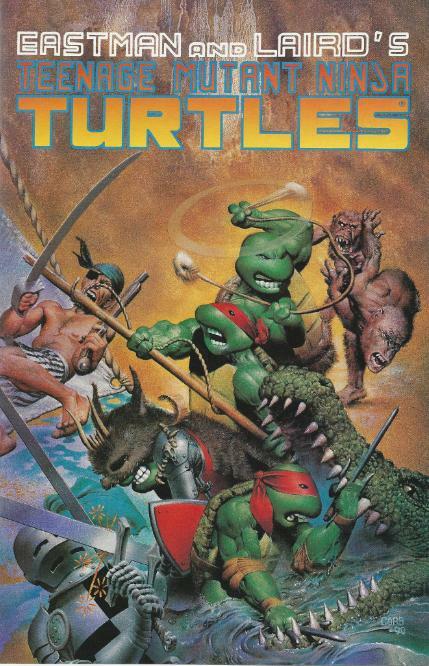 Much like Corben’s other TMNT story, “You Had To Be There”, this one grabs the Turtles and thrusts them into strange lands and predicaments at breakneck speed and pulls them out just in time for the conclusion and before you can start asking any questions as to the hows and the whys. Renet just sent them a Time Cube because sure, why not? And falling into the center of all creation returns everything to normal because I dunno, the issue had to end SOMEHOW. But I guess that’s not Corben’s fault. He didn’t write this issue (though “random contrivances transporting characters to strange lands to fight bad guys” sure feels like a Corben trope). Jan Strnad’s script seems to be operating under a singular motivation: Give Richard Corben the chance to draw the Turtles in as many different time periods and facilitate as many different fight scenes as possible. In that regard, Strnad’s script succeeds, but it doesn’t make for a very coherent or even remotely intelligent story. It’s just a showcase for Corben’s pretty art. And Corben’s art sure is pretty. While I can’t say I’ve any firsthand experience with Corben as a storyteller, since he didn’t write this issue, I can see why people worship him as an artist. His inking and coloring lend a superbly three-dimensional quality to the Turtles (though they kinda look like they’re made of clay). The inking might be a bit too heavy for some tastes, and at times it felt excessively “dark” for such a lighthearted and silly tale, but it makes his work instantly recognizable. He details the mortal Hell out of everything in the environment, which can make some of his smaller panels feel rather “busy”, but there’s a lushness and grandness to his settings, too. 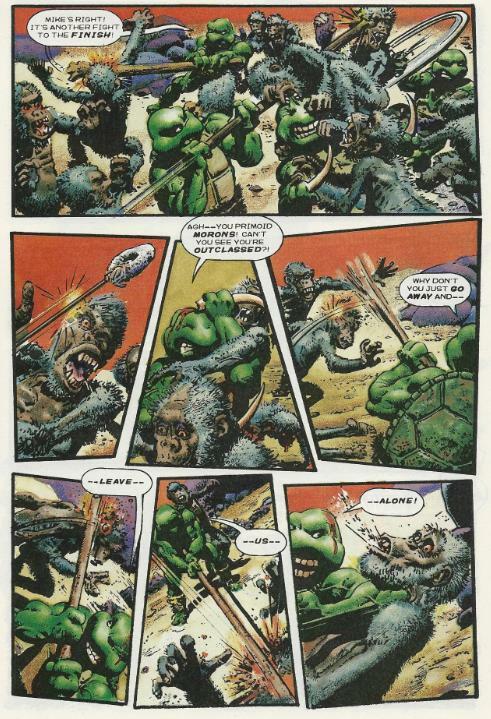 While it may expose me as an Indie Comics Plebian, I’m just not acquainted enough with the overall works of Richard Corben to really feel the excitement necessary to get worked up over “a TMNT comic drawn by Richard Corben”. And if I were to take this single issue as my introduction to Corben’s work, I’m afraid I still wouldn’t get what the big deal was. Nice inking, nice colors, but an awful story full of bad jokes, indistinguishable characters and just a string of corny fight scenes. Die hard Corben fans will get a lot more out of this than I did, I’m sure, but for the uninitiated, it’s just another goofy one-shot from the Vol. 1 “guest era”, except this time in lavish color. It's possible that by removing some of the conditions that created them (i.e. humanity) they erased themselves from existence. Kinda like a grandfather paradox, where they're no longer there to receive the time cube, thus resetting everything.It's still lame, but it makes some sense. Also, same thoughts on Corben's art.